Who Controls Your Online Music Sales? Thanks to DirectStereo.com YOU DO! Sure, you probably sell your music digitially on iTunes or Amazon (or both). But do either really give you enough control? Wouldn’t you like a little more flexibility in setting your MP3 prices? Wouldn’t like a bigger cut of the sale? 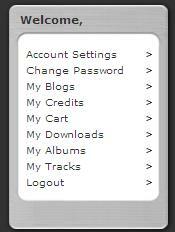 How about widgets that let you easily sell your music on any website, blog, or service were you can embed the code? If so, you may want to check out a new service from DirectStereo.com, offering independent musicians greater control and greater payouts than other digital music sales platforms. You obviously keep full ownership of your music. You get to keep up to 70% of the revenue for each sale. You can setup a blog or get an artist page with a unique URL. You can earn credits by rating tracks from other artists. People can comment on tracks in the system. You can access simple widgets to copy and paste your music downloads for sale on your band site, blog, myspace profile, and more (on a side note, they’re working on a more advanced widget). Everything can be operated from a simple control panel where all options are available on every page (shown below). So what does DirectStereo.com offer that other digital music distribution services don’t? More flexibility and higher payouts (and since you can add a widget just about anywhere your fans hang out online, its reach is as broad as your own). So is there any downside? Perhaps a small one for some artists. When you upload individual tracks to sell, you’re required to offer them for free for two weeks before setting your prices (and with albums you have to make two tracks from the album available). Now if you’re already doing this temporarily through your Myspace page or official site, it shouldn’t be a big deal (and personally I’m a big believer in artists leveraging occasional free music against better monetization options – a topic for another day). But if it really bothers you, and that policy doesn’t change in the future, you can always upload them and simply not promote them there until the two weeks have passed. Other than that, if anyone takes them for a test drive, I hope you’ll stop by here and leave a comment on this post to share your experience with other artists.